ST JOHN'S, Antigua – West Indies captain Dwayne Bravo said it was the "belief" they could win which helped his team to pull off an exciting 15-run victory in the first ODI against England at the Sir Vivian Richards Cricket Ground on Friday. The allrounder added that the win was "extra special" as it came on the day when three legends – Sir Anderson Roberts, Sir Curtly Ambrose and Sir Richard Richardson, the Windies Team Manager – were knighted for their services to cricket. "The key was belief…we believed as a team. We knew that despite the start they (England) got that coming onto the end of the match, once we kept picking up wickets and the run rate kept going up, it would be difficult for them," Bravo said. "It also helped to have the Number 1 bowler in your team and that was crucial as we dried up the boundaries at the end of their innings. To win the first match means a lot for us. We showed alot of character to bounce back against a very good team." The captain was referring to England's opening partnership of 96 between debutants Moeen Ali (44) and Michael Lumb (106). Bravo led the West Indies recovery with an unbeaten 87 off 91 balls after they slipped to 45-4 in the 16th over. They eventually fought back to 269-6 off their 50 overs. He shared in two brilliant century partnerships – 108 for the fifth wicket with Lendl Simmons, who made 65 off 94 balls, and then another 116 in just 10 overs with Darren Sammy who blazed 61 off 36 balls. West Indies then limited the visitors to 254-6 off their 50 overs. Sunil Narine bowled well to end with figures of 10-1-36-2. 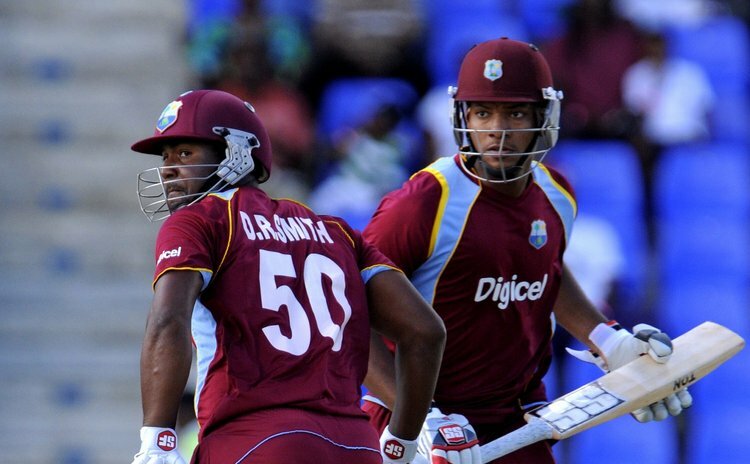 "The partnership between Lendl Simmons and myself was crucial and it allowed us to rebuild. We did not have the kind of start we wanted but we had the belief that once we recovered we could win the game," Bravo said. "That allowed Darren Sammy to come and play his usual flamboyant way which made a big difference. At one point it looked like we would get 220, but Sammy's innings allowed us to get up to around 270 and we felt as a bowling group that we would defend that." Bravo added: "It is always good to see the legends around and it inspires all of us. A few days ago we saw the unveiling of the statue for Sir Vivian Richards and today we saw the knighthoods for the three legends. I am very happy that on this special day we made it extra special with a West Indies win." The teams will meet in the second ODI on Sunday at the same venue. The third and final ODI is on Wednesday.